I had an evening meeting in Connecticut and after a quick night’s stay, awoke at 4 am. En route to home, I swung by the Farmington. What a day. Landed 11: four browns, two rainbows, and five brookies. Even better was that six took a #16 Elk Hair Caddis with orange dubbing (to mimic October Caddis). I had tied it the day before, as a test pattern, and it was absolutely shredded by the end of the day. I arrived at dawn with two fly rods: a 000-wt. for dries and my 11′ 3-wt. Euro-nymphing rod. I immediately landed two up top. When that ended, I started to tightline nymph the same run and landed five more fish. Some real fighters. Particularly effective was a #22 midge pupa behind a #14 Frenchie. The prettiest fish of the year came in this stretch. 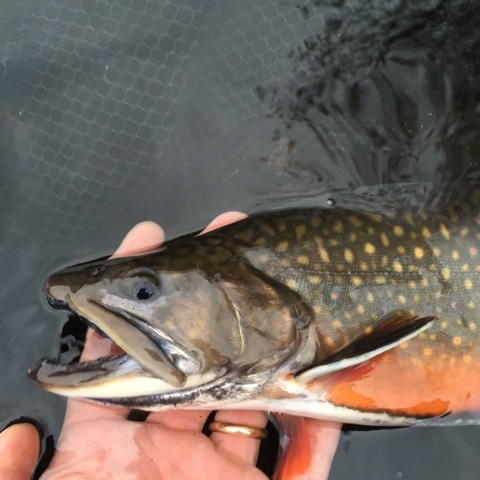 It’s the male brookie above, with a kype, pronounced humpback, and ablaze in orange. At 14″, it was such a display of beauty. The photographs don’t do it justice. It was a special moment to admire it and to let it go, with the hopes that it will generate many progeny. I was very impressed with the Farmington. All day, I saw quite a few Caddis, BWOs, and midges rising steadily. And, get this: I was the only angler as far as the eye could see. I grabbed lunch at a small mom-and-pop sandwich place. An older gentleman saw my waders and shirt and came up to me. We decided to eat together and we shared fishing stories, most of which were true. I love speaking with someone who is as addicted to fly fishing as I am. A mutual support group. I soon found myself at a gorgeous and very long stretch, with riffles at the top and steadily rising trout in the middle. We were the only anglers. I didn’t do well fishing the middle part of the pool. My new friend didn’t find action up top and switched to nymphing. I wanted to stay with the dry fly. I threw all of the obvious ones at them. Nothing. So, I decided to move closer to the riffles. I figured the trout would have less time to inspect a fly, and the quick water would mask any drag and my presence. Fortunately, I was right. I decided to fish the Elk Hair Caddis, as it’s easy to see and it was fun to fish a larger dry vs. the usual midges needed on the Swift. Four trout came to the net. It was so fun to see takes on a fly I had tied. Truly satisfying and meaningful. I thanked this new friend by giving him some of my favorite flies. He was so incredibly kind and generous. He fishes the Farmington most days. The farmington sure is a special place. I've only been once and certainly need to go back. What impresses me the most about the river isn't the huge browns, but the amount of sizable brook trout in the river despite all the stocking and fishing pressure. The thing is, some stretches are loaded whereas others have very few. It seems as though you found a stretch with quite a few brookies and that male is just an awesome fish! 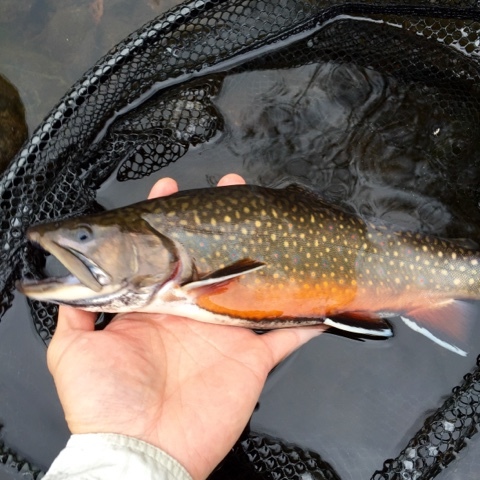 That's a big time brookie right there…huge and in full autumn color! Doesn't get any better than that! Thank you, RIBT! I appreciate the kind words. I'm not very familiar with brookies but have long appreciated their beauty. This is a fish I will remember for a long time. Fought like crazy, and as I pulled it in, I saw a flash of orange and knew this was a different fish. I think it's great that nearly 1/2 of the fish in the Farmington right now are naturally generating. The state does a great job of managing the fishery through a very scientific process. More here on their project to manage Survivor Strain.